We’d love your help. 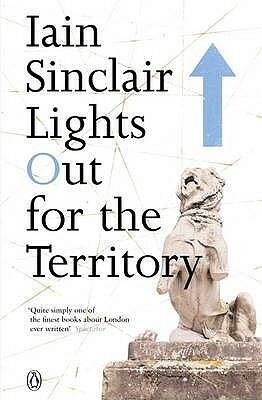 Let us know what’s wrong with this preview of Lights Out for the Territory by Iain Sinclair. To ask other readers questions about Lights Out for the Territory, please sign up. Are there any photographs embedded in Sinclair´s "Lights Out for the Territory"? If so, how many? Thank you! Perhaps it is simply Sinclair overloard (1000 pages of his in two weeks), perhaps the concurrent surfeit of images from London dissuaded me. I felt this text was inferior to London Orbital; I also collapsed to a minimal degree per some of Sinclair's personal bifurcations (to cite Roubaud) which I felt flat. His poetic waxing on pitbull culture was an ever-so-prescient for a rasher of recent events. Sinclair's stories overflow with woe yet they amaze and elicit. At times brilliantly inventive and eye-opening, at times frustratingly oblique and obscure, I found this book a frustration and a delight in almost equal measure. Sinclair's 'psychogeographic' meanderings through the underground history, culture and communities of various parts of London is an acquired taste, and a piece of writing that requires significant application by the reader. Despite my interest in London geography(having studied the course at a London university) I found some of Sinclair' At times brilliantly inventive and eye-opening, at times frustratingly oblique and obscure, I found this book a frustration and a delight in almost equal measure. Despite my interest in London geography(having studied the course at a London university) I found some of Sinclair's expositions impenetrable as they often require prior knowledge of the various poets, philosophers, writers and local personalities that he references. This said, the chapters that touched on topics as disparate as the history of St Pancras Old Church, the imagined community of the East End, the lives of the elites on the north bank of the Thames, and the alternative history of St Paul's Cathedral were profound, surprising and enthralling. The idea of the flaneur, the urban explorer who wanders the city landscape in search of deeper meaning and making imaginative connections between place and people through time and space, is certainly a powerful method for interpreting the city and succeeds in explaining London as an organic and ever-developing morass of people, ideas, histories and experiences. In this way, Sinclair opens up new avenues of inquiry and brings to the surface aspects of London that could easily have been forgotten. I would suggest that this book is better read as a series of short pieces of imaginative journalism, rather than one work with a running narrative. After all, the book is underpinned by a number of separate essays written by across a long period of time. What a great odd (eccentric?) book about one's city which is called London. But it's a London that many will not know. The loose term would be psycho-geography. Touring one's city with fresh eyes or just to drift among the architecture and its people. One picks up history like it was trash left over the night before. The Surrealists, specifically Andre Breton, started to walk through a cityscape without a map at times, but always keeping the eyes and ears open for new discoveries or new ways to f What a great odd (eccentric?) book about one's city which is called London. But it's a London that many will not know. The loose term would be psycho-geography. Touring one's city with fresh eyes or just to drift among the architecture and its people. One picks up history like it was trash left over the night before. The Surrealists, specifically Andre Breton, started to walk through a cityscape without a map at times, but always keeping the eyes and ears open for new discoveries or new ways to frame 'history' in a new light. Guy Debord and company did the same with excellent results. I always felt the hidden gems of a city aren't something you'll find in a tourist guide, but hidden lives steadily lived. Iain Sinclair is a master at bringing the hidden people and economies of a city to surface. Sinclair's London and Luc Sante's New York writing are rare accounts of the the invisible architecture connecting a city to it's people. I read this while on a recent trip to London thinking I'd also use the Museum of London's "streetmuseum" iPhone app, but I quickly realized the best w I always felt the hidden gems of a city aren't something you'll find in a tourist guide, but hidden lives steadily lived. Iain Sinclair is a master at bringing the hidden people and economies of a city to surface. Sinclair's London and Luc Sante's New York writing are rare accounts of the the invisible architecture connecting a city to it's people. One of the best books about London ever written. Utterly brilliant. Staggering writing. Read a 45 page excerpt for grad school. The idea of psychogeography is fascinating, and the chapter on the Grail interested me because I am interested in the Grail. However, if I were to explain that psychogeography is, my explanation would probably be found wanting. The feeling that I understand what it means, however is strong, and I thank the author for imparting the idea on me. I gave the book two starts for sharing the idea with me, and I look forward to reading Alan Moore's Jerusalem to get to know a bit more about the idea. The The idea of psychogeography is fascinating, and the chapter on the Grail interested me because I am interested in the Grail. However, if I were to explain that psychogeography is, my explanation would probably be found wanting. The feeling that I understand what it means, however is strong, and I thank the author for imparting the idea on me. I gave the book two starts for sharing the idea with me, and I look forward to reading Alan Moore's Jerusalem to get to know a bit more about the idea. The chapter on the Grail and the Kray brothers also contributed to the two stars. Apart from those three elements, I did not enjoy this book. Most of the people mentioned are very obscure, and a lot of the prose was a bit disjointed, moving from topic to topic, and then maybe coming back to the same topic in a later paragraph or chapter. Sometimes this works really well, but after 200 pages, I was mainly frustrated with the seeming lack of coherence, and realized that in the cases where it did work, the euphoria was not enough to balance out my irritation. Furthermore, the tone was a bit negative. Maybe it was tongue in cheek, but I found it to be mostly catty and condescending. I think this book requires a resident's understanding of London. I can enjoy the writing, but the observations of geography and culture are never going to hit home for me. To be dipped into, when in the mood. This idiosyncratic book is sometimes amusing, sometimes irksome. I suppose you might learn something about London, but I as I read I thought, "this guy is trying to show how clever he is". There's no doubting the erudition of Sinclair, which sparkles in virtually every sentence. The book is supposedly about London, but really the places and people he visits or describes are launch pads for a disquisition on whatever interests him, from graffiti to houses to the river to all sorts of individuals, recognizable and obscure. At the level of detail and abstraction he gets to it demands close reading and can be difficult to follow. So, while often fascinating, it is abstruse at times. F There's no doubting the erudition of Sinclair, which sparkles in virtually every sentence. The book is supposedly about London, but really the places and people he visits or describes are launch pads for a disquisition on whatever interests him, from graffiti to houses to the river to all sorts of individuals, recognizable and obscure. At the level of detail and abstraction he gets to it demands close reading and can be difficult to follow. So, while often fascinating, it is abstruse at times. For example, the section on the artist Brian Catling who seems to operate in a world abstracted from everyday life, while living very much in the material world. Or, when comparing Catling to Henry Moore he says of Moore's sculptures "These grave forms do not so much affect memory as displace it, decant their own weight, position themselves in our mappings of the city like railway temini." Whilst I kind of get the gist of it, this is either profound or gobbledegook and I'm unsure which. And so it is in many parts of the book. When he disapproves of or dislikes something he shows it: "The toilet-club sit down ravers" in reference to "deregulated shamans, equal opportunity visionaries" in London. Incredible, impressive, prodigious collections of details are thrown in casually all over the place. For example, referring to a London School of Film course on technique in a discourse on cinema, he notes that the critic David Thomson is one of the exceptions who actually noted attendance there as a credit on his resume. Where does he get it all from? Cinema Purgatorio is perhaps the most straightforwardly readable chapter and fluently humorous, as he describes his attempts, minor successes and failures to build a career in the world of cinema. Then there is substantial space given over to Lord Jeffrey Archer and his apartment overlooking the Thames. Sinclair obtains agreement to visiting Archer's apartment and which sends him off on a riff about the elitism of art and the lives of people who can afford it and who seek to enhance their status through their baubles, while living in a universe disconnected from the realities of most people. I was a young adult at the time Jeffrey Archer was at the top of his game in Thatcher's government and as a trashy novelist. I also experienced some degree of schaden freude at his fall from grace, when he was caught in a lie over the use of prostitutes. So, Lord Archer's Prospects is a chapter that was easier to follow and engage with. And maybe that's the weakness of the book - without prior knowledge or contextual insight on his various themes, it can be hard to track. The essential Sinclair book, with some of his later excursions across, around and within London coming off as an attempt to recapture this book's intense richness and breathless excitement as he brings to life the London that can be lived in. Although I am averse, in general, to eulogists of London who, altogether, grossly overstate its global cultural/historical ascendancy, what Sinclair has done here is provide a practical method to remake a city, any city. He achieves this with a combination The essential Sinclair book, with some of his later excursions across, around and within London coming off as an attempt to recapture this book's intense richness and breathless excitement as he brings to life the London that can be lived in. Although I am averse, in general, to eulogists of London who, altogether, grossly overstate its global cultural/historical ascendancy, what Sinclair has done here is provide a practical method to remake a city, any city. He achieves this with a combination of a journey that can be adapted/replicated by the reader and his own characteristic prose-styling, being himself an underrated and visionary poet (search out 'Lud Heat'). Though books like 'London Orbital' may have reached a wider audience for Sinclair, their essential origin is here and what they miss is the additional function of this book as a definitive directory of occult currents, ancient and modern, that run through the city still, even after the brief period of 90's visibility that Sinclair's book provided. Dense, complex and enthralling, Sinclair riffs on London in wild cluttered prose that echoes the intense life and history of the city itself. Every page sparks a digression and every digression a point of further study. Along with London Orbital this book constructs the only kind of meaningful picture of.a city sagging under the weight of its own past, giving life to the buildings and people and the very streets that comprise it. This is a brilliant and interesting book of journeys around London, that will resonate if you are familiar with some of the hidden gems that exist, some of which are now lost. If you are not, there is enough wonderful pieces of knowledge, places, people and culture to encourage anyone new or not to Sinclair to want to wander and discover the world of Mr Sinclair. An crazy/entertaining/violent/funny/etc journey through the streets and areas of London. Probably the most readable historical text you will ever read. Sinclair covers the criminal underworld of turn-of-the-century London and beyond, the early world of the British publishing industry, street art, the occult, and much more. Or 7/10 perhaps. Though maybe I should give up the whole impossible of grading books, unless I stick rigorously to marking them against their standards. Tricky. Anyway, this is the first Sinclair text I've read from end to end. I suspect it isn't his best (the fragments cannot be made to cohere) but there's much to enjoy. A skeptical but dedicated psychogeographer. Journeys across London. Myth, leylines and conspiracies mixed with cinema criticism and history. Quite compelling. Makes me want to read the rest of his stuff. Highly commended. There is even a lovely picture of Howard (Mr Nice) Marks rolling a spliff outside MI6. I thought this would be better,but unlike the classic London Orbital too much time is spent not on the interesting journeys around london but on the author waffling about obscure artists and other such rubbish. The film stuff at the end is brilliant though. This book changed my way of thinking about literature. Content-wise, it's one man going for a few walks, which is fine, but it's the style, rhythm and cadence of the writing that make it so special. Sinclair's peak was probably '94 through to around 2001, but the pinnacle is probably this one. Very enjoyable read. Dragged in certain chapters, but more than made up for it in others. I loved the connections he makes and the ground he covers. Iain Sinclair is a British writer and film maker. Much of his work is rooted in London, most recently within the influences of psychogeography. Sinclair's education includes studies at Trinity College, Dublin, where he edited Icarus, the Courtauld Institute of Art (University of London), and the London School of Film Technique (now the London Film School). His early work was mostly poetry, much of i Iain Sinclair is a British writer and film maker. Much of his work is rooted in London, most recently within the influences of psychogeography. His early work was mostly poetry, much of it published by his own small press, Albion Village Press. He was (and remains) closely connected with the British avantgarde poetry scene of the 1960s and 1970s – authors such as J.H. Prynne, Douglas Oliver, Peter Ackroyd and Brian Catling are often quoted in his work and even turn up in fictionalized form as characters; later on, taking over from John Muckle, Sinclair edited the Paladin Poetry Series and, in 1996, the Picador anthology Conductors of Chaos. Sinclair was for some time perhaps best known for the novel Downriver (1991), which won the James Tait Black Memorial Prize and the 1992 Encore Award. It envisages the UK under the rule of the Widow, a grotesque version of Margaret Thatcher as viewed by her harshest critics, who supposedly establishes a one party state in a fifth term. The volume of essays Lights Out for the Territory gained Sinclair a wider readership by treating the material of his novels in non-fiction form. His essay 'Sorry Meniscus' (1999) ridicules the Millennium Dome. In 1997, he collaborated with Chris Petit, sculptor Steve Dilworth, and others to make The Falconer, a 56 minute semi-fictional 'documentary' film set in London and the Outer Hebrides about the British underground filmmaker Peter Whitehead. It also features Stewart Home, Kathy Acker and Howard Marks. One of his most recent works and part of a series focused around London is the non-fiction London Orbital; the hard cover edition was published in 2002, along with a documentary film of the same name and subject. It describes a series of trips he took tracing the M25, London's outer-ring motorway, on foot. Sinclair followed this with Edge of the Orison, a psychogeographical reconstruction of the poet John Clare's walk from Dr Matthew Allen's private lunatic asylum, at Fairmead House, High Beach, in the centre of Epping Forest in Essex, to his home in Helpston, near Peterborough. Sinclair also writes about Claybury Asylum, another psychiatric hospital in Essex, in Rodinsky's Room, a collaboration with the artist Rachel Lichtenstein. Much of Sinclair's recent work consists of an ambitious and elaborate literary recuperation of the so-called occultist psychogeography of London. Other psychogeographers who have worked on similar material include Will Self, Stewart Home and the London Psychogeographical Association. In 2008 he wrote the introduction to Wide Boys Never Work, the London Books reissue of Robert Westerby's classic London low-life novel. Hackney, That Rose-Red Empire: A Confidential Report followed in 2009. In an interview with This Week in Science, William Gibson said that Sinclair was his favourite author.